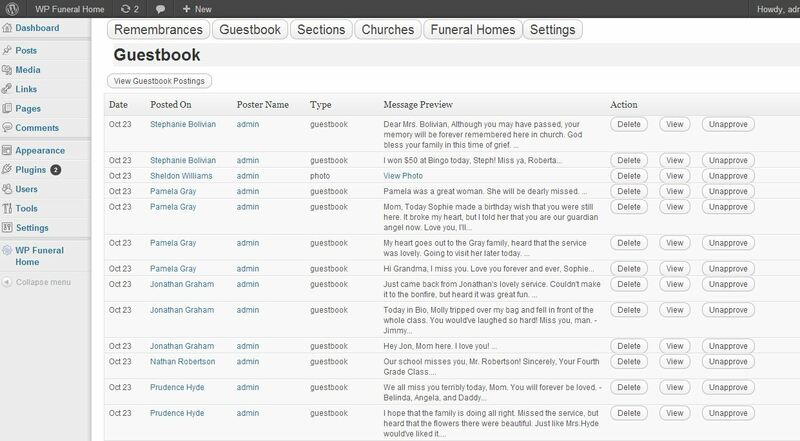 FuneralPress is an online website obituary management and guest book program for funeral homes and cemeteries, FuneralPress allows funeral and cemetery owners to display online obituaries and guestbooks on their website and allow loved ones to register on their site and post moderated guestbook comments. 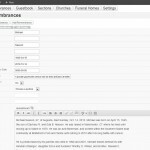 This plugin has many features and settings you can modify to make this plugin work for your website. We also offer a premium version with enhanced features which can be found on our website. Now works with WordPress Multi Site! 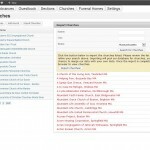 Manage Online Obituaries – The administrator can view, modify, and delete any obituaries that have been created under their Funeral Press account. Guestbook user’s receive confirmation emails on posting and approval. 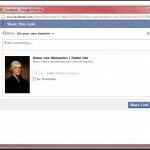 Facebook Integration – Clients can incorporate a Facebook link from WP Funeral Press to share obituary details, funeral information, or Guest Book comments. Guestbook Comments – Family and friends of loved ones may post comments and remembrances beneath the obituary in the Guest Book. Ability to translate plugin to multiple languages using the .po files. 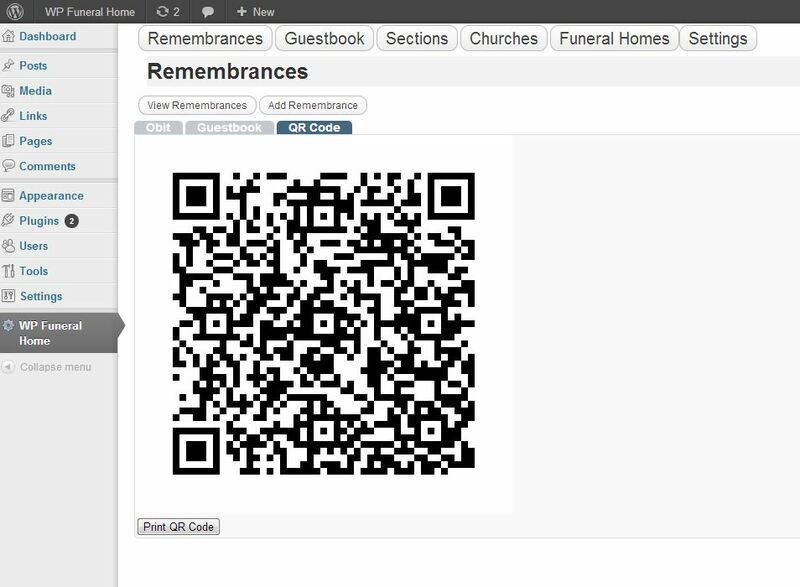 Obituary QR Code – QR bar code will be automatically generated and printed out for display at funeral home wake. Loved Ones can scan the code with any Smart Phone to view further obituary details on late loved one. 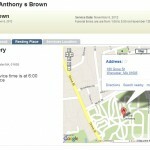 Location Maps – Provides a quick view of the funeral home, cemetery, and church location via Google maps. Guestbook Photos – Family and friends of late loved ones can add photos alongside the Guest Book comments. 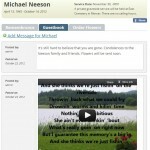 Guestbook Videos – Family and friends of late loved ones can add YouTube video links alongside the Guest Book comments. 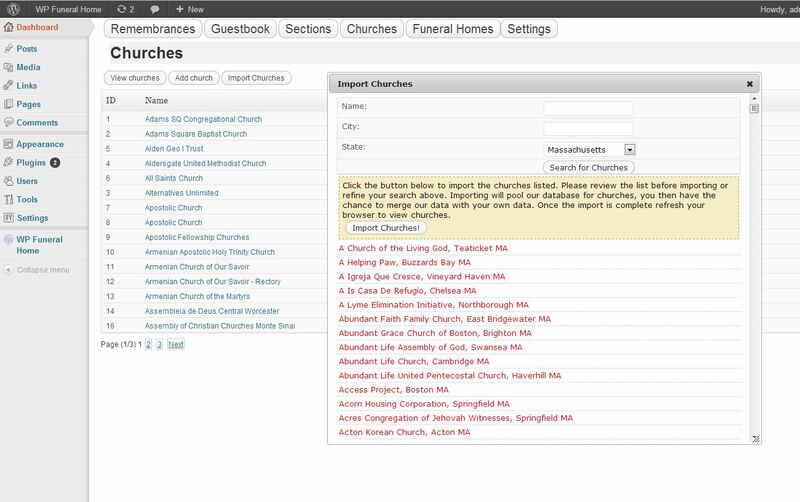 Import Churches (USA Only) – View the latest list of U.S. churches to import and apply within the administrator’s specific area. Within the list, the administrator can search through the churches by geographic location, city, state, or religion. Import Funeral Homes (USA Only) – View the latest list of U.S. funeral homes to import and apply within the administrator’s specific area. Import Cemeteries (USA Only) – View the latest list of U.S. cemeteries to import and apply within the administrator’s specific area. Manage/Assign Sections – Administrator will remain in control of the assignment and management of funeral home locations, remembrances, and the Guest Book. Manage location – Management of this list, and the particular location to be highlighted, is also available. Support – WP Funeral Home Press will always be available for support and further software questions Monday thru Thursday 10am – 4pm EST – Non-USA Holidays. This feature is accessible with all versions of the plug-in. 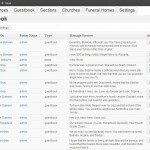 The administrator can view, modify, and delete any obituaries that have been created under their Funeral Press account. 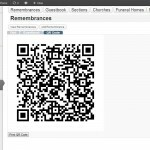 QR bar code will be automatically generated and printed out for display at funeral home. Clients can scan the code with any Smart Phone to view further obituary details on late loved one. 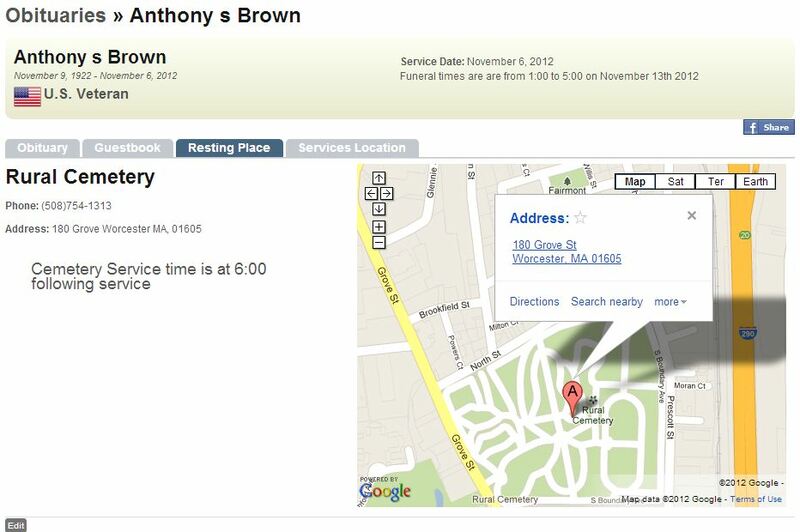 Provides a quick view of the funeral home, cemetery, and church location via Google maps. 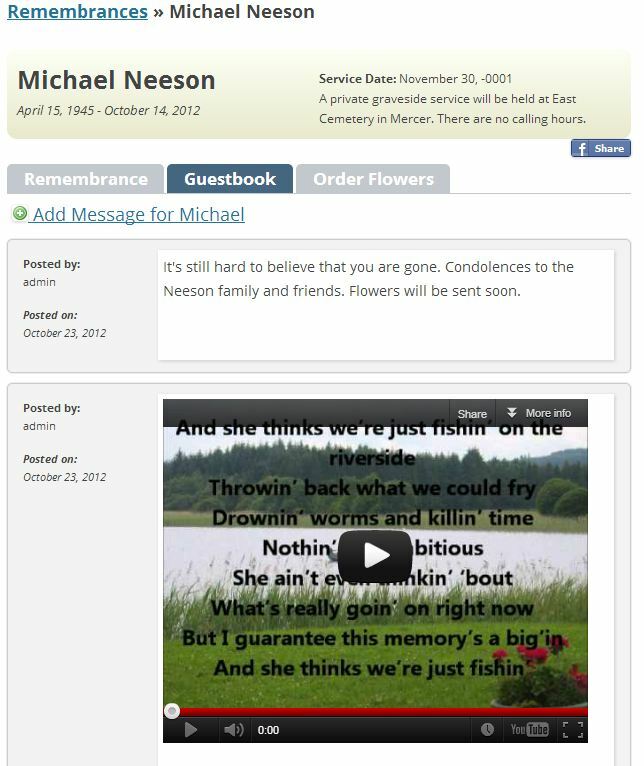 Clients can incorporate a Facebook link from WP Funeral Press to share obituary details, funeral information, or Guest Book comments. Family and friends of loved ones may post comments and remembrances beneath the obituary in the Guest Book. 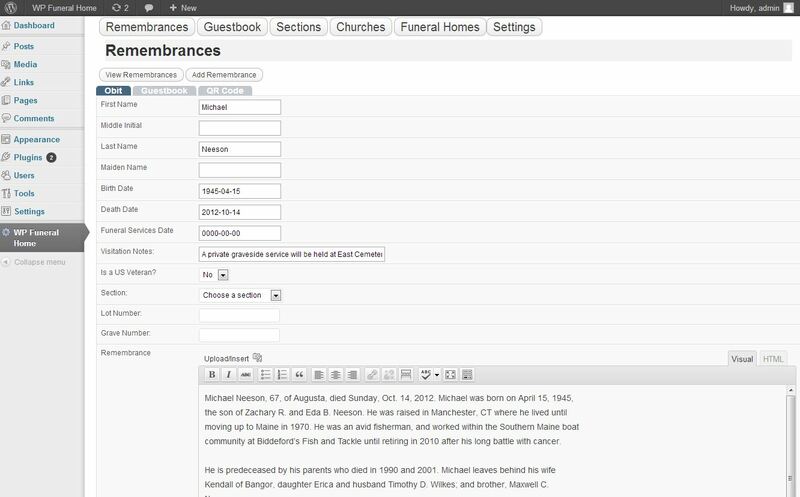 Under the premium version, family and friends of late loved ones can add photos and videos alongside the Guest Book comments. Guest Book Approval ensures that the remembrances of loved ones maintain within a respectable environment for grieving families, friends, and future potential clients. 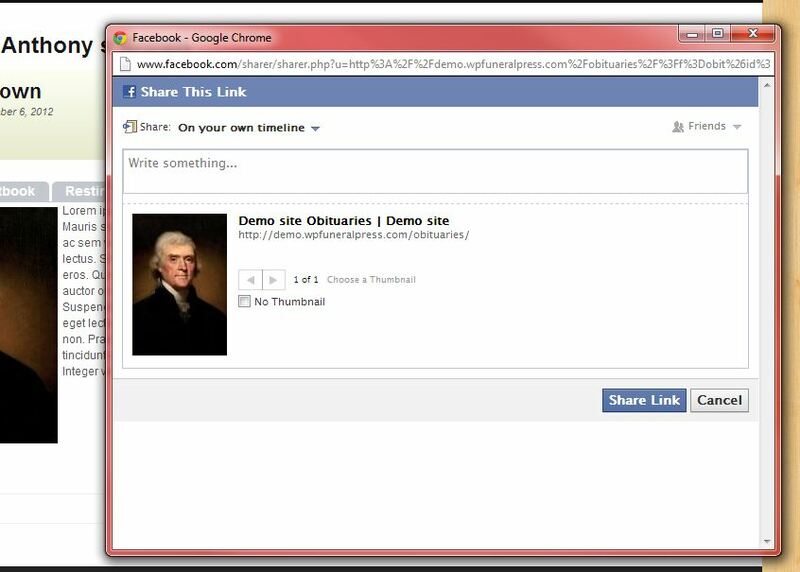 Comments, photos, and videos can be viewed, modified, or deleted. 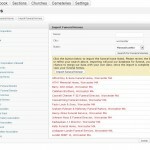 View the latest list of U.S. churches to import and apply within the administrator’s specific area. Within the list, the administrator can search through the churches by geographic location, city, state, or religion. View the latest list of U.S. cemeteries to import and apply within the administrator’s specific area. 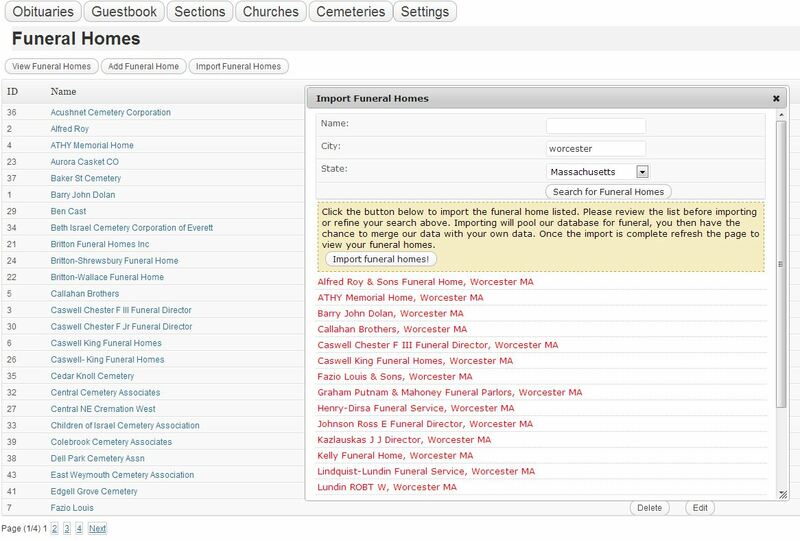 View the latest list of U.S. funeral homes to import and apply within the administrator’s specific area. Administrator will remain in control of the assignment and management of funeral home locations, remembrances, and the Guest Book. Management of this list, and the particular location to be highlighted, is also available. WP Funeral Home Press will always be available for support and further software questions. This feature is accessible with all versions of the plug-in. 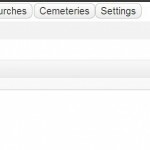 Option for WP Funeral Press to set-up and install the plug-in directly onto the administrator’s server. Free installation (see Pricing Page).